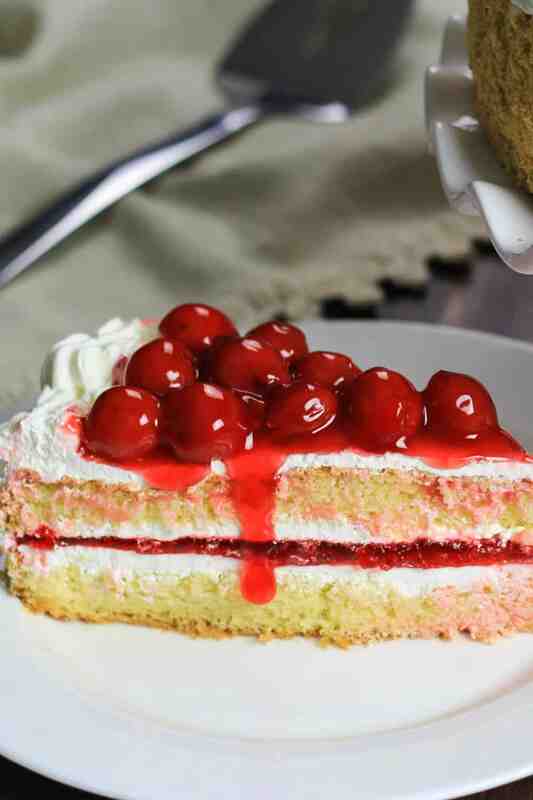 This Cherry Jello Cake Recipe is one of my favorite summertime desserts! 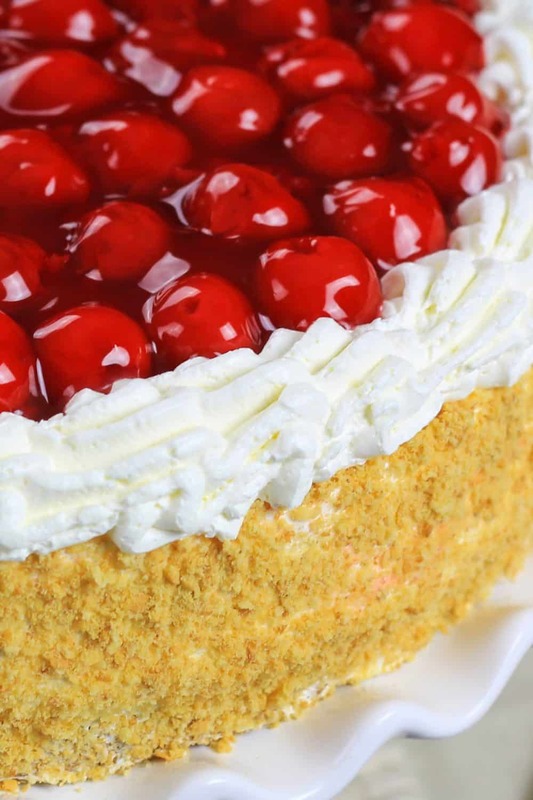 A homemade cake and layers of sweet cherry filling make it a hit you feel good serving. Do you enjoy making homemade cakes? Don’t miss our delicious and easy Strawberry Bundt Cake Recipe! Simple recipes are my favorite, but I also value a homemade product. This Jello Cake recipe combines my own homemade cake recipe with a simple prepared filling and icing that keeps the effort low and the flavor perfect. Below you will find the printable recipe for my from scratch cake recipe and directions on how to layer this to create a beautiful cake. 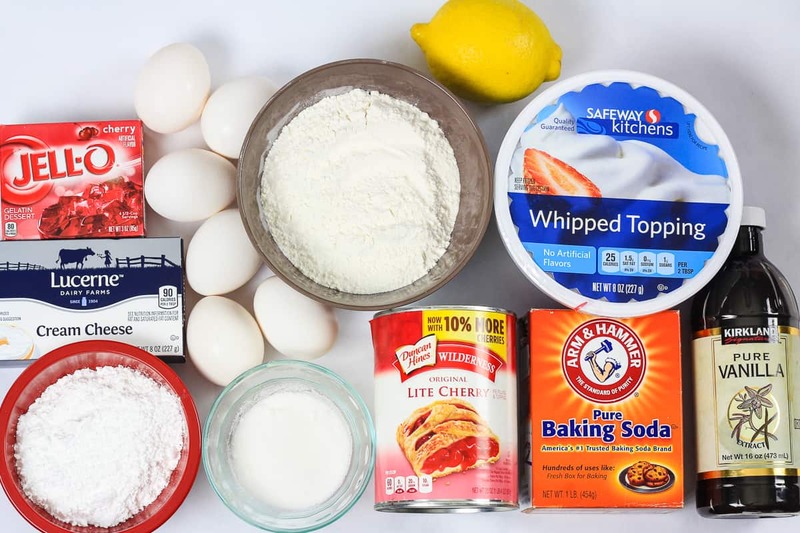 Using an electric mixer, you will begin by beating the eggs as directed before adding in the sugar and vanilla. When time to add your dry ingredients, I encourage sifting well first to prevent lumps. Following my directions, place into a springform pan for easy removal after baking. The cake will take approximately 30 minutes to cook through. While the cake is baking, you will prepare the filling using cream cheese, sugar, and of course, the cherry Jello packet. Follow my directions for mixing together the sugar and cream cheese, and prepare Jello to be a spreadable consistency. When you remove the cake from the oven, you will want to allow it to cool completely before slicing and filling with the prepared mixture. Follow my directions in the printable recipe below for building the layered cake with beautiful white and red layers and a final layer of whipped topping and cherry pie filling. Tip: When decorating a cake, I place 4 small pieces of parchment paper under the bottom of the cake. that way, when I’m done decorating, I just slide out the parchment paper and the edges around the cake are nice and clean. This Jello cake recipe is best served cold, so make sure to refrigerate for at least an hour prior to slicing for your guests or family. If you love this easy homemade cherry Jello cake, I know you will love more of our delicious dessert recipes. Make sure to check out the links below for more great recipe ideas. In the bowl of an electric mixer, beat the eggs for about 3 minutes on high speed. Add in the sugar and vanilla and beat for another two minutes. In a small bowl or custard cup, mix baking soda and lemon juice together. Once all of it becomes fizzy mix it into the egg mixture. Sift the flour, then gently fold it into the egg mixture using a whisk or spatula. Line a 9 inch spring-form pan with parchment paper and spray with nonstick spray. Bake on the lower rack for 28-30 minutes, or until a toothpick comes out clean after piercing the middle of the cake. 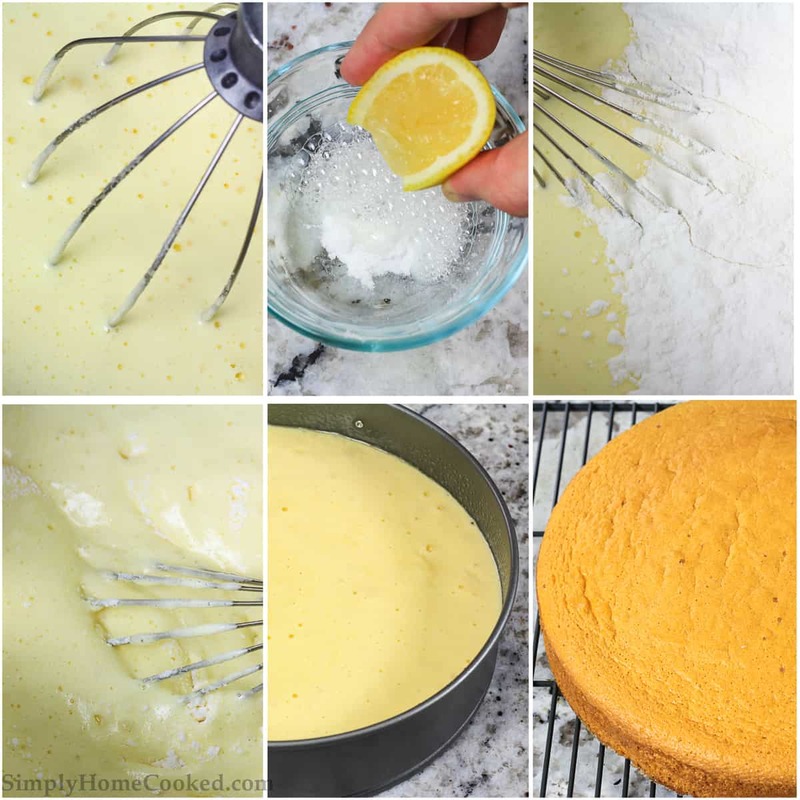 While the cake is baking, blend cream cheese and sugar on high speed using the whisk attachment of an electric mixer. Once it's blended well, add in the cool whipped topping. You may need to scrape the bottom of the bowl with a spatula to get the cream cheese out. Combine one package of cherry Jell-O with 1/2 cup of hot water and stir until the sugar dissolves, then add in 1/2 cup cold water. Let the Jell-O sit in a cool place just until it begins to thicken a little, but can still be spread around easily. Once the cake is cooled slice it in half. Place the bottom layer of cake back into the spring-form pan and spread the cream cheese mixture on top. Make sure to leave enough cream cheese filling for the rest of the cake. 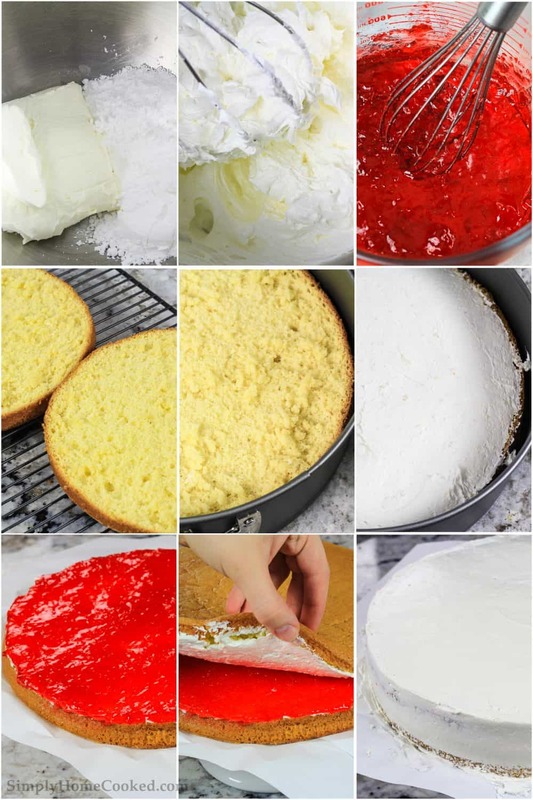 Spread all of the Jell-O on top of the cream cheese filling and place the cake into the fridge for about 20 minutes. Remove the chilled cake from the spring-form and place on the dish or platter you plan to serve it on. Spread the cream cheese mixture on the inner part other half of the cake and place it on top of the Jell-O so that the Jell-O is in between a layer of cream cheese filling. Spread the rest of the cream cheese filling on top and on the sides of the cake. You can either leave the sides as is or cover with finely chopped nuts or crushed graham crackers. You can decorate the top edge of the cake with extra cream cheese filling or you can just add the cherry topping alone. I like to pipe out a little border along the edge and then fill the middle with cherry topping. I made this and it turned out so delicious! Thanks for a great and easy recipe! Thank you for your great review Olesya, glad you enjoyed it!